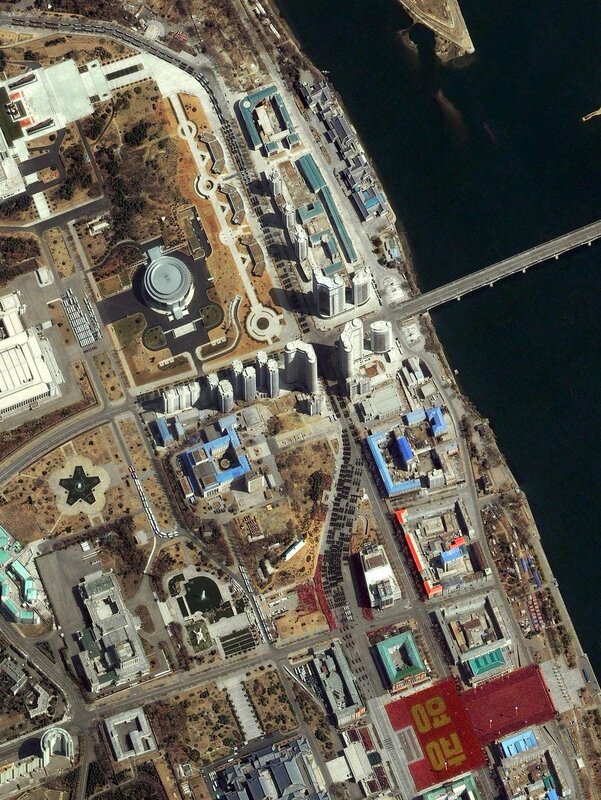 A revamped design breathes new life into one of the world’s online views of North Korea. 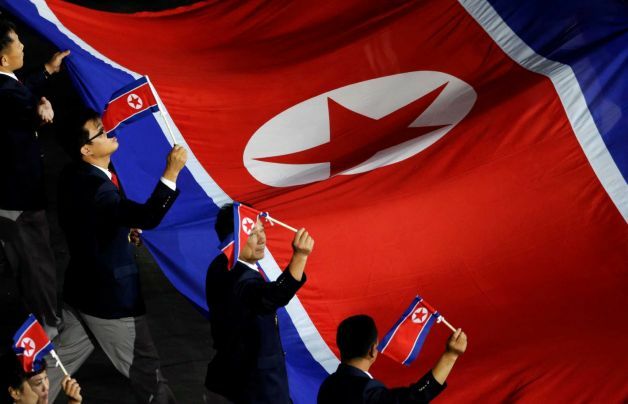 The flag of North Korea is portrayed in a photo of a “card stunt” during the Arirang Mass Games in a screen capture from http://www.korea-dpr.com. The North Korean elite of Kim Jong-un’s reign are predominantly male graduates of Kim Il-sung University born in Pyongyang or South Pyongan Province. According to Unification Ministry analysis of 106 core cadres in the military and Workers Party, 35.5 percent were graduates of Kim Il-sung University, the alma mater of Kim Jong-il, followed by Kim Jong-un’s alma mater Kim Il-sung Military University with 17.7 percent, and Kim Chaek University of Technology with 9.7 percent. Some 18.6 percent were born in South Pyongan Province, 16.3 percent in Pyongyang, 16.3 percent in North Hamgyong Province, and 14.6 percent in South Hamgyong Province. A whopping 94.3 percent are men. Only 2 percent of cabinet ministers are women, significantly lower than the 11.5 percent in China and 7 percent in Russia. While the cabinet mostly consists of relatively young technocrats in their 50s or 60s, the Workers Party remains heavily dominated by loyal apparatchiks in their 60s to 80s. The ministry explained that those who have been loyal to three generations of Kim Dynasty from Kim Il-sung to Kim Jong-un form the core of the party, but cabinet members seem more practically oriented. Jang Song-thaek told Kim Jong-nam to refrain from making comments critical of the power succession to foreign media, Japan’s Yomiuri newspaper reported from the southern Chinese city of Guangzhou, citing an unidentified source on North Korean affairs in Macao. Kim Jong-un took over the communist country following the December death of his father, longtime leader Kim Jong-il, marking the second hereditary power transfer in the North. The late Kim also inherited power upon the 1994 death of his father, the country’s founder Kim Il-sung. Jang, who has long been considered a key official in helping the new leader consolidate power, gave the recommendation to Kim Jong-nam during Kim’s trip to Pyongyang in May, the Yomiuri newspaper said. Still, Jang is believed to be on good terms with Kim Jong-nam, who has expressed doubts about his younger brother’s grip on power. Jang, who is married to the late leader Kim Jong-il’s younger sister, Kim Kyong-hui, is believed to be wielding a strong influence in state affairs as he serves as vice chairman of the powerful National Defense Commission, once headed by the late Kim. In January, Kim Jong-nam told the Tokyo Shimbun in an e-mail that he had “doubts about how a young successor with some two years (of training as heir) can retain the 37 years of absolute power” wielded by his late father. Kim Jong-nam also said “it is difficult to accept a third-generation succession under a normal reasoning” process. 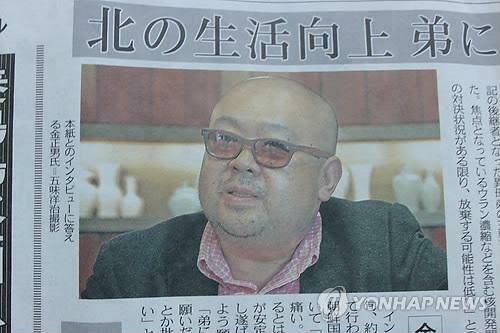 Kim, believed to be in his early 40s, has made critical comments to mostly Japanese media in recent years. He has been reported to enjoy a lavish lifestyle in the Chinese enclave of Macao after apparently falling out of favor with his father for attempting to enter Japan on a fake passport in 2001. TOKYO – In a risky gamble, Pyongyang is resting its hopes for the survival of the Kim regime on one woman – a dead one at that. Struggling to cement his dynastic credentials, young North Korean leader Kim Jong-eun has launched a mass deification campaign for his mother and the first lady of late leader Kim Jong-il, Ko Young-hee, who is believed to have died in 2004. Since May, Young-hee has been praised as the “Respected Mother”, the “Great Mother” and “The Mother of The Great Military First Korea”, as can been seen in a film and photographs obtained by Asia Times Online this month from Rescue the North Korean People! (RENK), a Japan-based citizens’ group supporting ordinary North Koreans. The idolization of Young-hee connects a missing link in the blood-heir’s succession over three generations from the country’s founding father Kim Il-sung to Kim Jong-il and to Kim Jong-eun. The video of Ko does not mention an inconvenient truth – Young-hee was born in Japan – the brutal colonial ruler of Korea from 1910-1945. She was born in the famous Koreatown, Tsuruhashi, in Osaka, in 1952. Her father, Ko Kyung-taek, made Imperial Japanese Army soldiers’ uniforms in a sewing factory during World War II. “North Korea needs to cover up the fact that Ko Young-hee was born and raised in Osaka,” said RENK spokesman Lee Young-hwa, adding that her family moved to North Korea only in the early 1960s as part of a repatriation program. The video and photographs stress that Ko Young-hee had a strong relationship with the military. The rare 85 minutes of video footage and 93 photographs of Ko Young-hee for the first time reveal her vivid appearance and voice. 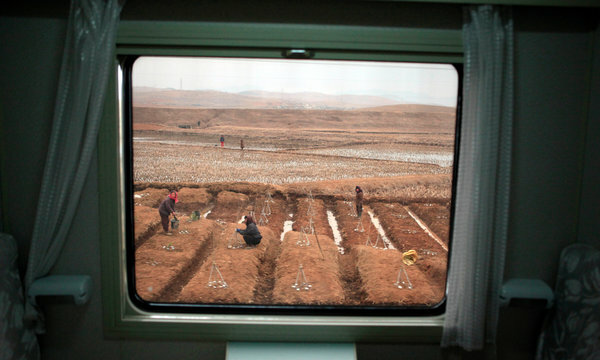 In the video and photos, she accompanies Kim Jong-il to military camps, factories and farms. She is seen riding a white horse, following her husband on another white horse. She inspects a barrage of rocket-propelled grenades with Kim Jong-il, with both wearing the same vintage Courreges sunglasses that became trademark apparel for her husband. They murmured words into each other’s ears and smiled. The video shows a very happily married couple. This image of Ko Young-hee was likely inspired by the Korean song General on a Galloping White Horse. In one scene, she visits a barrack and expresses concern about soldiers’ daily lives. She tastes a soldier’s home-made donut, then teaches them how to cook a potato-based donut. In the following days, she sends them sugar and cooking oils. The movie aims to conjure an image of the “Mother of The Great Military First Korea”, which is the video’s title. The movie uses emotional female narration and a rousing musical score in the classic North Korean style of propaganda. She is also seen holding a gun, suggesting a strong wife who always protects her husband. This was echoed scenes of Kim Jong-suk, or Kim Il-sung’s first wife and Kim Jong-il’s mother, who was a guerilla and communist politician. The images also showed Ko met many dignitaries abroad, stressing her precious role as the first lady. Ko Young-hee pictured with an unknown foreigner. The attempts to establish Ko’s authority also stress the Kim dynasty’s heroic family lineage, which stretches back to Jong-eun’s grandfather’s partisan guerilla activities against Japan in the 1930s. After Ko’s family moving back to North Korea in the early 1960s, she worked as a dancer for the prestigious Mansudae Art Troupe in Pyongyang, where she met Kim Jong-il. She is believed to have died in Paris due to breast cancer in 2004, which the video also does not mention. Ko Young-hee pictured with a young Kim Jong-eun. By sanctifying the late Ko, Kim Jong-eun is trying to underscore his authority as the North’s new leader. The efforts also come as the “young general” has been repeatedly seen with a woman who is believed to Hyon Song-wol, a former singer in a popular group called Bochonbo Electronic Music Band. However, making it tricky for propagandists there are no photos or scenes of Jong-eun with his parents. RENK’s Lee points out that this was because Kim Jong-eun was studying in Switzerland from 1996 to 2002 when the video was made. 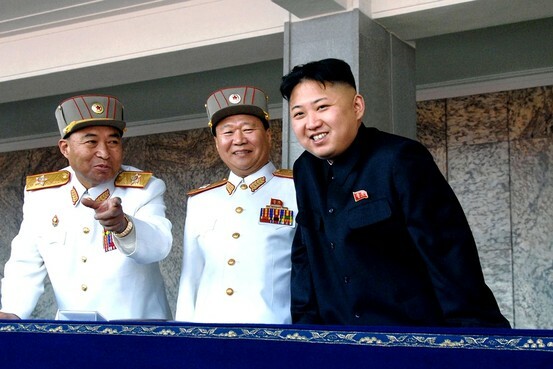 In contrast, North Korea has shown many photos of Kim Jong-il with his parents, Kim Il-sung and Kim Jong-suk. It is widely known among Japanese experts on North Korea that Ko Young-hee’s father moved from Cheju Island to Japan in 1929. He worked for Hirota Hokojo, a needlework factory under the control of the Imperial Army of Japan. This means Jong-eun’s grandfather was a collaborator with the Japanese imperialists. 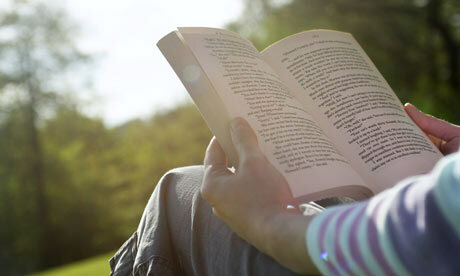 This can never be revealed by Pyongyang as it might shock the population. In addition, Young-hee’s younger sister, Ko Young-suk, and her family defected to the United Sates in 1998 in the middle of the nation’s “great famine”, in which millions of people died of starvation. This makes Kim Jong-eun’s aunt a national traitor. According to the South Korean media, Kim Jong-eun himself has given orders to execute any defectors by a firing squad and their families expelled to internal exile. Sanctifying Young-hee may provide indirect support for her son, but it is a risky ploy. Information on her birth and family may trickle out to the isolationist country, damaging his legitimacy as national leader. 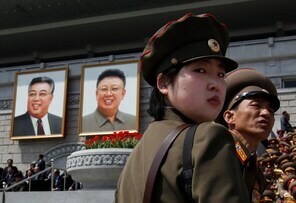 Ko Young-hee’s background continues to be one of Kim Jong-eun’s – as well as North Korea’s – dangerously weak spots. 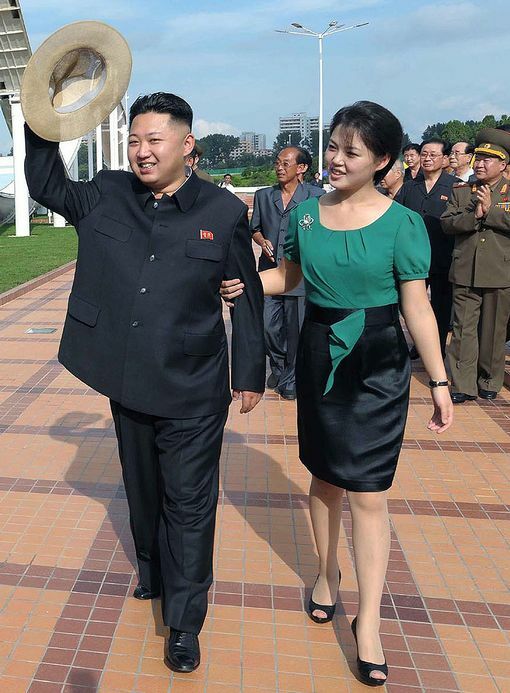 In the News – Who Is Kim Jong Un’s Mystery Woman? Sister? Lover? Girlfriend? Wife? Speculation is mounting over the identity of a mystery woman and the nature of her relationship with Kim Jong Un, Supreme Leader of North Korea, with whom she has been spotted on a number of public engagements. The short-haired woman, dressed smartly in a black suit, is thought to be in her 20s. However, South Korean intelligence experts have identified the woman as Hyon Song Wol, the former front woman of the Bochonbo Electronic Music Band and a married mother whom they believe is having an affair with the North Korean leader. According to the Daily Telegraph, the Bochonbo Electronic Music Band produced several hit singles that were “hugely popular among the North Korean masses,” but Hyon “disappeared from public view at the time that Mr. Kim emerged as the heir-apparent to his father Kim Jong Il.” Hyon reappeared in public to perform at a concert in the North Korean capital, Pyongyang, in early March to mark International Women’s Day. Rumors of the affair have reportedly been circulating for some time. Kim Jong Un is believed to have begun a romance with the singer a decade ago, but was forced to end the relationship by his father. She is then said to have married a North Korean army officer and given birth to his child. Nothing is known of the current whereabouts of Hyon’s husband and child, or whether she even remains married. However, others speculate that the woman is in fact Kim Jong Un’s wife, a view shared by Andrei Lankov of Kookmin University in South Korea, an expert on North Korea, who thinks it highly implausible that the Supreme Leader would so publicly reveal his girlfriend. He told CNN that her presence is likely a part of a carefully constructed campaign to appear “much more approachable, humanlike and soft on people” in order to distance Kim Jong Un from his father and predecessor. Likewise, Toshimitsu Shigemura, a professor at Waseda University in Tokyo and author of a number of publications on North Korean leadership, told the Daily Telegraph, “It is highly possible that this is his wife and that Kim is trying to show a new style of leadership, of a husband and wife, in North Korea.” Shigemura also observed that Kim Jong Un had been uncharacteristically quiet in the weeks leading up to the woman’s sudden appearance. Earlier this year he engaged in a large number of high-profile appearances, in an attempt to shore up his position as North Korea’s new leader, following the death of his father in December. It is possible, Shigemura said, that his recent silence could be the result of behind-the-scenes preparations concerning how to publicly introduce his spouse. 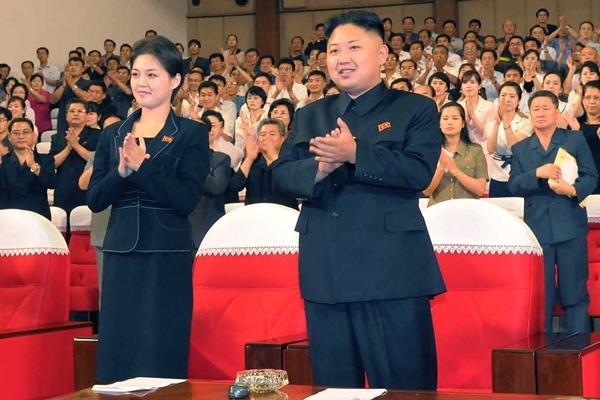 The mystery woman was first seen with Kim Jong Un watching a performance of North Korea’s Moranbong band at a theater in Pyongyang on Friday. (The performance included the appearance of various Disney characters, which the Walt Disney Co. confirms were used without its permission.) On Sunday, North Korean state TV showed the woman standing beside the Supreme Leader during a ceremony to commemorate the 18th anniversary of the death of his grandfather. (PYONGYANG, North Korea) — Mickey Mouse and Winnie the Pooh took the stage in North Korea during a concert for new leader Kim Jong Un, in an unusual — and unauthorized — performance featuring Disney characters. 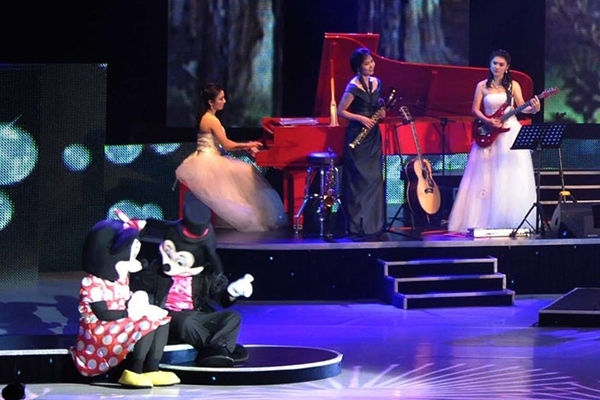 This appears to be the first time Disney characters have been included in a major performance in Pyongyang, though Winnie and Mickey have been popular among children for several years. Backpacks, pencil cases and pajamas imported from China often feature Disney characters, and stories such as “Dumbo” have been translated into Korean for North Korean schoolchildren. 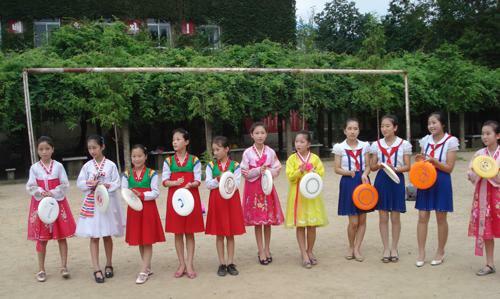 However, it is unusual to make such images a central part of a North Korean performance and publicize them on state TV. Zenia Mucha, chief spokesperson for The Walt Disney Co., said the use of Disney characters in the North Korean performance was not authorized by the U.S. entertainment company. “This was not licensed or authorized by The Walt Disney Company,” Mucha told the AP by telephone on Sunday. U.S. sanctions prohibit the import of North Korean goods to the United States, but do not ban the sales of American consumer products in North Korea unless they involve officials or companies on the U.S. Treasury Department’s sanctions blacklist.